A business can’t just be in it for the money. They need to have a broader mission and a purpose, or a vision for what they want to create. Having a mission will sustain you during the lean times, and also help you find and resonate with your ideal customer. But, how can you quickly and efficiently convey your company’s mission, vision, or purpose? You can communicate your brand’s intent with a company tagline. 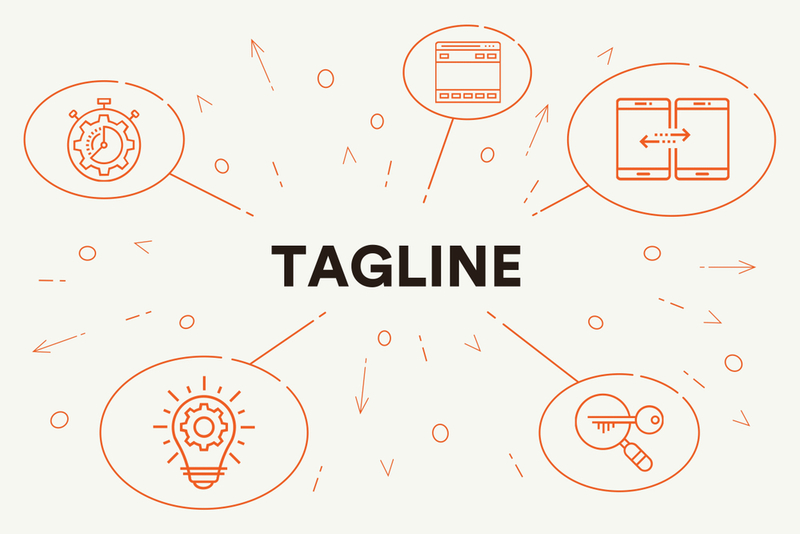 A tagline is a catchphrase intended to express your brand’s ethos or personality. You’re probably already familiar with company taglines. Some of the most popular are Nike’s ‘Just do it’ and ‘Like a good neighbor, State Farm is there.’ What do these taglines convey? Nike’s tagline communicates that it’s not just an athletic apparel or equipment company, it’s inspirational. It almost sounds like a battle cry. State Farm lets people know with their tagline that they aren’t another heartless insurance company; they care and help people like a neighbor, like someone you know on a personal level. Their tagline conveys a comforting tone to the listener or reader. What do all taglines need to be successful? As you can see with the above examples, Nike’s and State Farm’s taglines are concise, catchy, and emotional. They’re simple and easy to remember, and they’re also matched to the company’s overall mission. The taglines are like mini mission statements and concise soundbites that communicate the company’s purpose to the viewer. Why should a company create a tagline? A tagline will differentiate you from your competitors, and a tagline is a quick way to convey your mission to the audience. With a short and catchy company tagline, your company’s purpose will resonate with your target customer. A tagline can go on products, merchandise, brand apparel, and marketing materials. You can reuse it again and again. Catchy taglines are also inherently viral, and you can quickly spread your message and get your company noticed with a compelling one. Why should a company invest in a professional tagline writing service? Ignoring the importance of a company tagline won’t help your brand stand out from the competition. And, you won’t have as easy of a time conveying your message to a listener. When someone asks what your company is about, coming up with a pitch on the fly can seem daunting and awkward. Your tagline will help convey your message, and you can always point to your tagline to help you when communicating about your company. Also, a tagline is evergreen. You pay for it once, and you can use it and benefit from it again and again. Taglines are also versatile and can be used and repurposed for a variety of marketing materials. What can a professional writer do for your tagline? Competition to create and sustain a tagline is fiercer than ever before. Not only do companies have taglines, but politicians and political movements also have adopted the use of taglines. It can be hard to get your tagline to catch on with consumers. But a professional tagline writer and creator knows how to crystallize your company’s mission into a catchy and concise tagline. Professional copywriters are not only talented with words, but they also have an understanding of human psychology and emotions. A professional tagline writer can take your brand’s values, and streamline them into a relevant tagline that will resonate with your target customer. Our team of dedicated and professional writers will take the time to learn who your target audience is and what your mission is, and craft a compelling tagline that you can use again and again, and repurpose for different marketing materials for your future business needs. Company taglines are incredibly crucial for you to differentiate yourself from the rest of your competitors. Don’t leave something this essential for your future business in the hands of an amateur. Contact our team of professional writers today and get started on crafting a tagline that will pay off dividends for you in the future.